Plant nutrition is the most complex and difficult growth influencing factor to understand, hands down. To understand all of the reactions, interactions, and processes that are involved with plant nutrition is an enormous task, similar to fully understanding how all of the other plant growth factors interact and influence one another to make maximum results possible. So, let's get started...the guidelines below are general guidelines for indoor gardening crops. The exact nutritional requirements for every plant will be a little bit different, so GET TO KNOW YOUR PLANTS! The major nutrients your plants require are nitrogen, phosphorus, and potassium. Nitrogen is used for green, leafy growth and is the nutrient most likely to become deficient in an indoor garden. Phosphorus is needed to grow healthy roots, large flowers, and well developed fruits. Potassium is needed for thick, strong branches and stems, and is also required in substantial amounts to produce fruits and flowers. In general, plants can use twice as much nitrogen as phosphorus or potassium during the vegetative stage of plant growth. During the flowering stage the opposite is true, and plants generally use twice as much phosphorus and potassium as nitrogen. Depending on your specific situation, phosphorus levels can often be pushed even higher than that. During the first couple weeks of flowering most gardeners use a feeding formula for the transition that is somewhere between their vegetative feeding program and their flowering regimen. 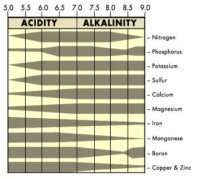 The secondary nutrients that your plants require are calcium, magnesium, and sulfur. These nutrients may not be used in the quantities that the primary nutrients are, but they are extremely important. 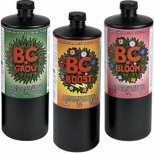 Quantities of all three are needed throughout the entire growing and flowering process, with calcium and magnesium being the most heavily used. Furthermore, the need for calcium and magnesium increase during heavy fruiting or flowering. If you pay no attention to these secondary nutrients, calcium and magnesium are the most likely to become a problem (deficient). Products like Cal-Mag exist so you can give your plants a little extra right when they need it. The biggest problem with micro-nutrients is that they tend to combine chemically into forms that your plants cannot use. Micro-nutrients in a usable form are called chelated. Always look on your fertilizer package for chelated versions of these nutrients. These are usually labeled as "fully chelated", but will sometimes be noted by the addition of EDTA after the nutrient name. There are two things you can do, in addition, to ensure your micro-nutrients are chelated and available to your plants. First, you can use fulvic acid or humic acid as a nutrient additive. Humic acids, and the fulvic acid portion of them in particular, are extremely powerful oxidizing agents. In their presence, micro-nutrients become available in their chelated forms. Second, you can try to maintain a healthy population of beneficial micro-organisms in the plant root zone. Beneficial micro-organisms produce humic and fulvic acids as they carry on biological activity. Their actions break down nutrient compounds into usable forms and tend to keep them in that form for the benefit of the plants. Plants in turn exude carbohydrates, sugars, and esters from their root zone into the soil that the micro-organisms thrive upon. This symbiotic relationship is the whole idea behind true organic gardening.